First Machine & Tool Inc.
For over 30 years, First Machine & Tool Inc. has been a provider of Design, Build & Certification services. Our personnel are well versed with the requirements of Geometric Dimensioning and Tolerancing (GD&T), Specializing in Analytical, Attribute, Functional and SPC type Gaging. 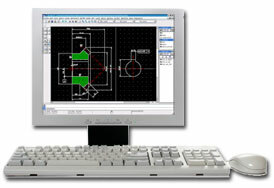 We are also familiar with CMM, Machining, Layout and Welding type Fixtures to suit your needs. We are determined to provide the highest quality Gaging & Tooling, with on time deliveries at competitive prices. All of our Gage or Tooling designs are thoroughly detailed to identify critical information such as Datum's, Gage feature locations, size and permissible tolerances. All critical features of the design are identified accordingly to correlate with the final inspection report. The actual Gage construction consists of hardened steel locators and functional components, accurately ground for position, fit and function. All exposed Gage features are typically black oxided or anodized to protect them from corrosion. Complete CMM certification results and instructions are provided. Re-Calibration services, R&R Studies and Third Party Calibration services are also available. Up to this point our relatively large and diverse customer base has grown primarily from referrals, which we feel speaks highly of our experience and reputation. Some of the Industries we currently serve include the Automotive, Aerospace, Nuclear, Defense, Plastics/Composites, Food Processing and Medical Industries. We are ISO Certified, Including Design. This is only a brief description of what First Machine & Tool Inc. is capable of. If you're interested in learning more about First Machine & Tool Inc. or you would like us to quote any of your future needs, please contact one of our representatives to discuss or arrange for a meeting at our facility or yours.